Basic transit information: If you don't find what you need here, the best source in the region is 511.org's BART Strike Info page. Telecommuting: During the July BART strike, the Metropolitan Transportation Commission urged residents to work from home if possible and asked employers to offer flexible schedules. That's still the agency's advice. Carpooling: If you really have to drive, Bay Area transportation officials are encouraging carpooling. Carpool lane hours on I-80, I-880 and I-680 will be expanded to run from 5 a.m. through 7 p.m. The West Grand Avenue on-ramp in Oakland will be converted to exclusive carpool and public transit use from 5 a.m. to 7 p.m. If carpooling with neighbors or co-workers isn't an option, casual carpooling allows strangers to meet up and share rides. Check out 511's casual carpooling map for places to meet with other commuters. Or, visit RideNow or SF Casual Carpooling for places to find a ride, pick-up other commuters, and get more information. BART replacement bus service: As it did in the July strike, BART is planning limited weekday round-trip bus service. This time around, buses will run from the El Cerrito del Norte, West Oakland, Concord, Walnut Creek, Lafayette, Dublin/Pleasanton, San Leandro, Hayward, and Fremont stations into San Francisco from 5 a.m. to 8 a.m. and back to the East Bay from a stop near the San Francisco Transbay Terminal from 3 p.m. to 7 p.m. at no charge. (For full schedules during a strike check here.) Tickets will be distributed on a first-come, first-served basis at each station. People without a round-trip ticket will not be allowed to board in San Francisco to return to the East Bay in the evening. In the event a strike continues into the weekend, BART will have three buses at each of the stations named above and will offer limited round-trip direct service into San Francisco in the morning and then back in the afternoon/evening: Saturday buses will run from 6 a.m. to 9 a.m. and 3 p.m. to 6 p.m; Sunday buses will run from 8 a.m. to 11 a.m. and 3 p.m. to 6 p.m.
AC Transit: The East Bay transit agency says it will supplement its regular service with buses to San Francisco "to the extent possible." Bus stops inside BART stations will be moved to streets outside the stations. SamTrans: According to 511.org, SamTrans buses will serve temporary stops outside San Mateo County BART stations. The agency will provide a temporary shuttle from Colma and Daly City BART stations to the San Francisco Transbay Terminal. Passengers must pay a fare for this service, unlike the free rides offered during the July strike. Daly City BART bus stops will be located on DeLong Street, adjacent to the Daly City BART Station. Colma BART bus stops will be located at Colma Park and Ride lot, behind the Colma BART station.The shuttle will operate from 5:30 a.m. to 9 a.m. and from 3 p.m. to 7 p.m., Monday to Friday. Caltrain: According to 511.org, Caltrain will operate regular service. "All trains, including the Baby Bullet express, will stop at the Millbrae station to pick up passengers, who can park for free at the BART station, and also to provide transfers to the connector bus shuttle to SFO." Amtrak/Capitol Corridor: Trains to and from Sacramento to the South Bay will run on their normal schedule. San Francisco Bay Ferry will add supplemental service between Oakland, Alameda, Vallejo and San Francisco. Details of the service's plans: BART Strike Service Info. Muni: Muni has an an extensive list of transit, traffic and parking resources during a potential BART strike. According to 511.org, Muni plans to operate enhanced and supplemental bus services during peak hours with high priorities being: the Mission Corridor (Lines 14-Mission, 14L-Mission Limited, and 14X-Mission Express); between Caltrain Depot (4th and Townsend) and downtown/Financial District; and J-Church Line (to/from Balboa Park). Golden Gate Ferry and Bus: No supplemental service planned. San Francisco International Airport: SFO will run free buses between the airport and the Millbrae Caltrain station. 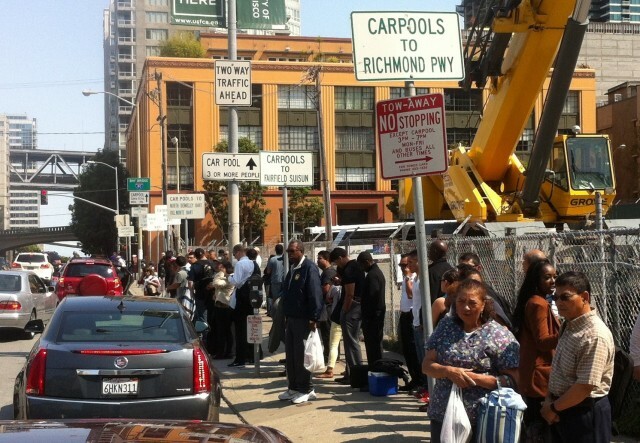 Free buses are also going to the ferry terminal in South San Francisco, which runs to Oakland. Oakland International Airport: The AirBART bus shuttle from Coliseum BART to the airport will suspend service if there's a strike. Car-sharing and ride-hailing apps: Services like Carma, Sidecar, Lyft, Uber, RelayRides and Getaround saw surges in use during the July strike. Biking: The San Francisco Bike Coalition has resources for finding bike routes, maps, and bike parking. Expect bike racks on buses to be at capacity.